The recent conflict between President Hassan S. Mohamoud and Prime Minister Abdiweli Ahmed has caused a gridlock in the Somali government’s operations. The prime minister did a limited and pointed reshuffle, which involved only two cabinet ministers. The problem with this new change was that it involved two close friends and allies of the president. The president, sensing a declaration of war by the premier, issued a decree rescinding the reshuffle. Some politicians and the UN Special Representative to Somalia, Nicolas Kay, have made many attempts to mediate in the conflict between the president and the prime minister, but to no avail. The Somali Parliament convened twice after more than 100 legislators attempted to introduce a motion of no confidence in the prime minister. Supporters of the PM interrupted these sessions and they were adjourned. Interestingly, Nicholas Kay recently warned Somali legislators against accepting bribes to vote Prime Minister Ahmed out of office, an admonishment that enraged some parliamentarians but was well-received by others for its frankness on the level of malfeasance in Somali politics. Is the conflict between the president and the Prime Minister due to ambiguities in the provisional constitution? While the provisional constitution needs some heavy-duty amendments, it is not the main reason why the country’s two top leaders are at loggerheads. Furthermore, the constitution states that the prime minister has the power to “appoint and dismiss members of the Council of Ministers.” The president, in essence, has no business interfering with how the PM runs the council of ministers (as long the premier does not violate the constitution). This endemic conflict between the president and the prime minister is nothing new. The last four presidents of the country (going back to 2004) have had major problems with their prime ministers. Ironically, with the exception of President Abdullahi Yusuf, each president had three prime ministers in their respective single terms. President Yusuf’s term was unique because he had no control over Mogadishu for more than half of his term – his government was initially based in Nairobi and later the Somali towns of Jowhar and Baidoa respectively. Of the 10 prime ministers the country has had since 2000, only two were not dismissed (Mohamed Abdi Yusuf and Abdiweli Gaas). Oddly, these two left office after a year because the tenure of their respective governments ended. However, the relationship, for instance, between Gaas and President Shaikh Sharif in the final several months of their term was marred by dysfunction, political competition, and mistrust. The average Somali prime minister stays in office about 1.3 years. The only one who stayed three years in office was Mohamed Ali Ghedi, under President Yusuf. President Yusuf’s other premier, Nur Hassan Hussein “Nur Adde,” lasted 2.3 years, a tenure so acrimonious that it led to the president’s eventual retirement. Six prime ministers stayed in office an average of 1.1 years, and one (Mohamed Farmajo) only about seven months. Hassan Abshir and Nur Adde were the only ones who stayed two and 2.3 years respectively. Interestingly, all these prime ministers universally complained about the head of the state trampling on the constitution and, hence, acting as imperial president. The presidents, in turn, questioned the prime ministers’ intransigence and tendency to act on their own. Many times, the sitting parliament became a tool for the sitting president. The Siad Barre syndrome. Every Somali president wants to be like the late dictator who ruled Somalia for 21 years. The Somali word for president “Madax-Weyne” (The Big-headed) semantically does not help the psychology of the country’s leader very much. Furthermore, the current system is confusing. For instance, according to the constitution, the president, as Head of State, appoints the prime minister, the head of the government, but he cannot dismiss him; only the parliament can. The prime minister is in charge of the Council of Ministers and, hence, the day-to-day operation of the government. While the current president presumably understands his constitutional powers and limitations, he has been accused of usurping the prime minister’s powers by acting as both the president and prime minister. For the two years he has been in power, President Mohamoud has had two prime ministers he himself carefully and diligently selected. Comprehending the constitution is one thing, but abiding by it is another. Prime Minister Abdiweli himself braced for confrontation from day one. According to a source close to the prime minister, Abdiweli told some of his supporters that he would “fight” the president and would never be like his predecessor, Abdi Shirdon. At least the prime minister has kept his promise because his working relationship with the president has been marred by discord and open hostility. The power structure in the country is based on an unwritten understanding between the bigger clans. For instance, the president and prime minister come from the two largest clans in the country, the Hawiye and the Darod. Being a member of these two clans is not in itself enough to qualify to be president or prime minister; one has to come from the two largest sub-clans of each of these two big clans (Abgaal or Habar Gidir for the Hawiye and Marehan or Majertein for the Darod). 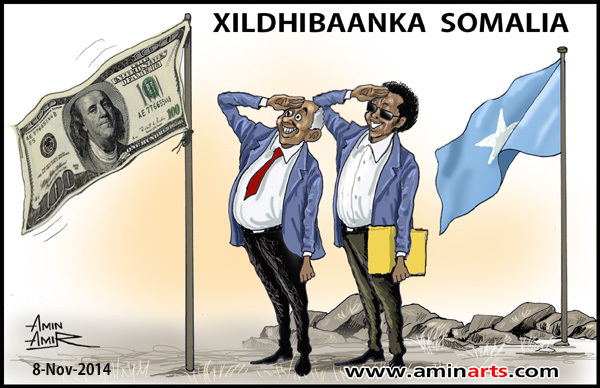 Somali politics was referred to, in humorous vein by one politician, as an everlasting struggle between Tom and Jerry, the famous cartoon characters. The two clans are constantly chasing each other and trying to outdo each other. What this division of power creates is layers of various constituents and divided loyalties for either the president or the premier. Many times, the interest of one clan group may overlap the interest of the country. For the current administration, the general elections scheduled for 2016 are creating panic and a rush to win over new supporters among the myriad clans. It won’t come as a surprise if President Mohamoud appoints a new Majertein premier (a sub-clan of the Darod) because his first two premiers were Marehan, another sub-clan of the Darod. That is unlikely to happen before 2016. Hassan M. Abukar is a political analyst and can be reached at abukar60@yahoo.com . Without a robust constitution and strong systems Somali cannot stand. It will take commitment and an overhaul of value system of Somali leaders to move Somali forward.